This little big guide has been made just to give some advices to beginners who have doubts about which trucks to choose. Once more, the best idea is to try many different trucks to decide which kind is more comfortable for you to skate... because, at the end, the decision about the skate’s material is a personal matter influenced for many things as brands, budget, previous experiences, skater’s level, kind of skate preferred, etc. But for beginners who have no references, this text could help with the first decision. The trucks are the metal parts between the deck and the wheels. Joining those elements is their mainly function, but they are also used to do many tricks grinding with them over obstacles. Baseplate: As the name suggests, is the truck’s base. It is the part that is fixed on the deck and has four bolts for it. Hanger: is the biggest and most visible part, the one used to grind. Kingpin: The kingpin is the main center big bolt that unites all the truck’s parts. Axle: Is the cylinder inside the hanger where the wheels are. Bushings: They are the rubber parts that cushion and offer resistance when making a twist while skating. Bushings have different hardnesses so each skater can find his preferred. The harder ones are more used for street tricks or ramps where twists are not fast, because they offer more stability, and the less hard ones are used for more free and fast twists. Bushings are composed by two rubbers each truck. Pivot Cup: Pivot cup is a small part that plays an important role and has to be always in good conditions. Is a rubber cone that is stuck in the hole in the base of the truck where it fits the hanger. If this part gets too worn, the truck will be loose and become unstable. Risers: The risers are optional parts that don’t use to be included when buying trucks. They are made out of rubber or plastic and their measurements are similar to the trucks’ bases, they are emplaced between the trucks and the deck. Their function is to increase the trucks’ height, or to absorb impacts and vibrations. Those that increases the height are called ‘risers’. With them, bigger wheels can be used, avoiding the ‘wheel bite’, that is what happens then the wheel touch the deck in a sharp turn. Those used to absorb impacts and vibrations are called ‘shock pads’. In this case, they are very thin and usually made of rubber, so they do not alter the height noticeably. As we said before, they are optional parts. 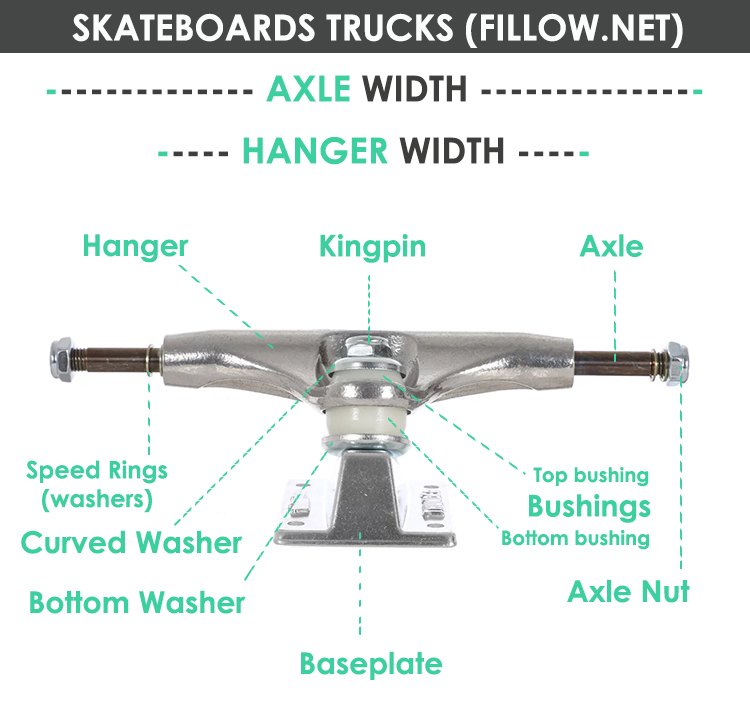 Many skaters don’t use them for their trucks. The trucks’ material affects mainly their weight and hardness. Lighter trucks make easier doing technical tricks, but if you just want your skate as a transport medium, the weight is not that important. Most standard trucks are made of aluminum alloy for the base and the hanger and steel for the axle. For higher quality trucks you can find various materials such as magnesium or titanium, that are considerably lighter but still have enough resistance. Trucks’ height is the measure from the base to the hanger. This height will keep the deck more or less far from the ground and will define the maximum measure of the wheels that can be used, avoiding them from rubbing on the deck when doing sharp turns. Brands usually classify trucks as Low, Mid or High. Low trucks are preferred to street skating and technical tricks (flips, etc). This kind of trucks gives to the skateboard a low centre of gravity, and that is why the tricks are easier. With low trucks, you would have to use small-medium wheels. Mid trucks are the most versatile. They are fine if you want to use your skateboard for many purposes, such as skatepark, street and locomotion. Medium wheels can be used. High trucks are ideal for using large wheels (from 57 mm). Mostly used for cruisers, to move around in the city or just for ramp, with big wheels. The width of the trucks is quite important and is conditioned by the size of deck you want to use... because you won’t want the wheels to be protruding from your board or too much centered. That is why you should use a trucks’ size according to your deck’s size. Sometimes it is not easy to know exactly the width of a truck, because some brands name their trucks measuring the hanger, others do it based on the entire truck, and, to complicate it even more, some use inches and some others millimeters. You can see below a summarizing table with the different measurements used and the deck’s size recommended for each one. We offer it just as a reference, there may be variations according to personal preferences. You can also see the brands that use each kind of measure. As you can see on the table, there are mainly four ways to name a truck. The most used is to measure the hanger in inches, so you can filter your search on our website to find 5.0, 5.25, etc. Independent name their trucks measuring the hanger in millimeters (although it is not entirely accurate) and 129 is equivalent to 5.0 and 139 to 5.25, more or less. Is you are choosing your first trucks, the most important thing to look for is that the width have to match with the size of your table. The second thing is the height, depending on what you are going to use your skateboard for, and the wheels’ size you want. We recommend for the beginners to choose basic trucks with an affordable price, because the first times you won’t notice the difference with the lighter materials that increase the prices significantly. 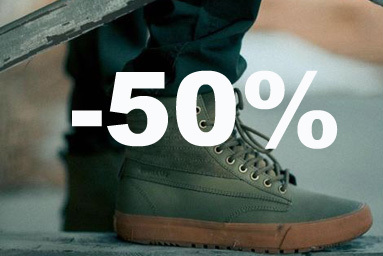 Fillow work with brands specialized in skate, so all the products in our website have a good quality and performance. And finally, as you already know, for any question you may have, we are at your disposal.